With our expertise in all aspects of organizing any sort of event. we can help you give some added flavor to your business meetings or bring our characteristic touch of class to your conferences, sporting events and product launches. The success of a conference or of a golfing day out for your clients rests on the perfect harmony of many elements: a unique location, ease of access to that location, the beauty of the surroundings, the expertise of the support staff, the quality of the welcome and of the catering, and the rich variety of leisure activities avaiable at the site. The Sablé-Solesmes Golf Club holds the key to making your event a stunning success! Directly accessible by TGV(Sablé Station is only 4 km away), the Sablé-Solesmes Golf Club is very easy to find by car, and has a private parking lot with 160 spaces. Surrounded by natural beauty of great diversity, our grounds offer 150 hectares of forest, greenery and waterways. The environment is peaceful, indeed ideal. The club house itself is at refined and convivial. 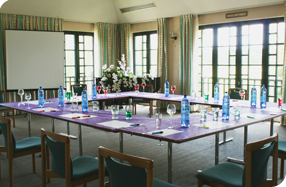 and contains facilities specially designed for your business meetings, facilities which can hold up to 100 people. Our adaptable rooms provide spaces ranging from 36 to 100 square meters, and are configurable to your specifications. A team of trained professionals is at your command, ready to help your plan and organize all of your gatherings. All of our facilities lend themselves perfectly to all types of meetings, shows, cocktail parties and banquets. We are entirely at home, also, planning large golfing events. For the past 4 years we have hosted a professional tournament on Europes Challenge Tour, and we can place all of our expertise at the service of businesses and other groups who wish to organize golfing days with us for their clients. pro-ams. introductions to golf or tournaments under their sponsorship. Our clients' loyalty and enthusiasm are our most satisfying reward! Activities available will give conferences and other gatherings that unmistakable touche of excellence and originality.